This image was taken in 1989 on a very cold morning – something that I think is pretty evident from the shot. I took out my Mamiya RB67 and it was so cold that my hands were actually sticking to the tripod. There was a thin sheen of frost over the trees and grass that gave the area a real visual crispness. the background and I’ve further emphasised that by using a relatively shallow depth of field. During the printing process I burnt the background in slightly just to draw the gravestones out a little more. When you’re printing, it’s very important to choose the correct grade of paper – in this case, on multigrade paper, using grade 31⁄2 and 00 – to achieve the tonal impact you want to give to your shot. It’s not just a matter of ensuring that your printed tonal range matches the tonal range of the negative. It’s not about getting your blacks black and your whites white because, although tonally accurate, this won’t necessarily be interesting. Photography is often about interpretation. A little bit of contrast here and there will increase the impact of your image by showing your viewer that certain sections of your image are significant. That’s what I did with the frost, for example. Choosing the right level of contrast made it much more apparent on the print and it really holds the viewer’s eye. Then the rest of the image is another contrast to balance it all out. The trick is to do it without it looking too obvious. I want to draw attention to the composition here. One thing that really annoys me is when two things line up in a picture. I’m talking specifically about when you have two objects, one in the background and one in the foreground, and they line up so they look as if they’re touching each other. For me, there either has to be a gap between them or a proper overlap. In a situation like this image, with things all over the place, it’s difficult to find the right position where you haven’t got some awkward shape that appears to growing out of something else. That’s a crucial part of the composition for me. I’ve photographed in graveyards many times and this is perhaps the most successful shot that I’ve ever produced. 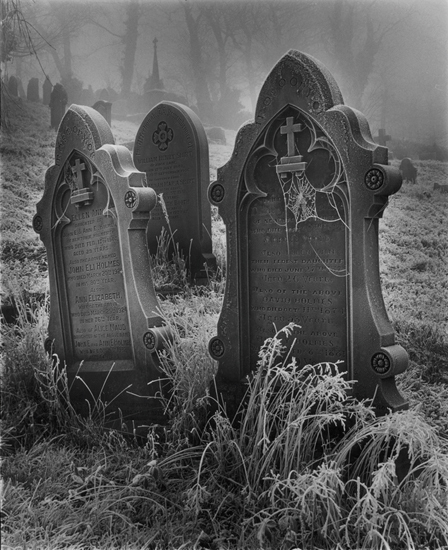 Graveyards have always been seen as photogenic subjects. There’s something mysterious about them. They evoke thoughts of death, but in a very quiet way. For example, Highgate Cemetery in London is a spectacularly gothic location, so it is often used in photographs. If you’re in a place like that when faced with these kinds of weather conditions you’re onto a winner. This image looks like it came straight out of a Universal Studios horror movie. If you look at those old black & white movies, the application of light, shadow and shape is absolutely incredible. It’s such strong imagery. You watch the film and you get absolutely involved. I’m full of admiration for the lighting guys who worked on those films. They had no way of seeing the results of their craft until it was finished. The only thing they had to go on was the picture they had in their heads. Often they would work without lightmeters – all they had was experience. too manipulated for my tastes, was undeniably technically proficient. I also love the gritty stuff Japanese photographers were producing around the same time. Christian Vogt was another photographer who had an impact on me. His work with simple figures, shapes and props was very interesting. are so many brilliant and exciting photographers out there and it would be almost impossible to discover them all in a lifetime. There’s always someone out there who can teach you something new, and even, in some cases, alter the direction you take with your work.